Maraschino cherries have always been a staple in our household. Whether to add to a frigid glass of Coke for a cherry Cola or to a Sprite for a Shirley Temple, we always carried these little neon red gems. It wasn’t until later in life that I discovered “real” cherries. I was first introduced to these tiny wonders on a grocery shopping venture with my mother. There was a little resemblance to the bottled, dyed cherries that I had come to love and cherish. The stems were woody green and the bodies were solid instead of squidgy. 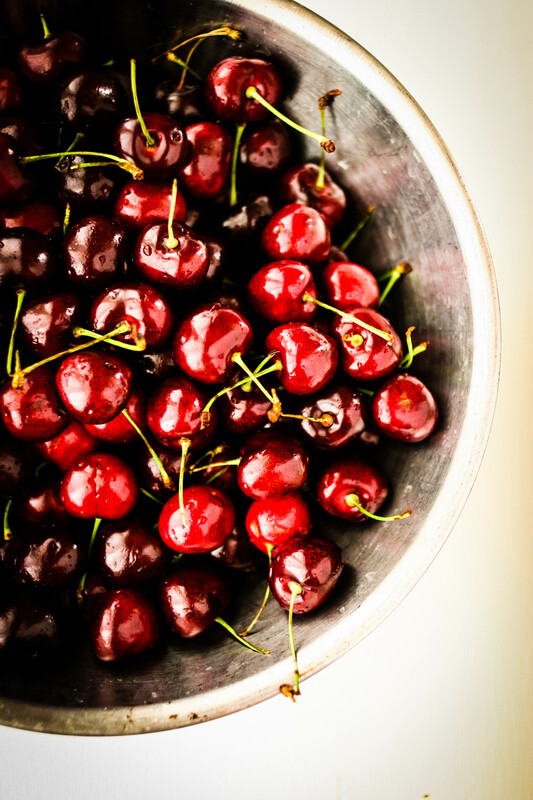 At first, I believed that the dark cherries were not as dazzling, but I skeptically allowed my mother to place them in the grocery basket with the rest of the produce, where I could keep an eye on them. Upon arriving home, I still had not made up my mind about this unfamiliar fruit, but curiosity got the better of me and I filled up a wooden bowl with these strangers and decided to give them a try. First, I pulled out the stem of the fruit. Staring at this minute, unblemished fruit, I realized that it looked just like a petite heart. How adorable! After admiring the cherry for a few moments, I decided to take a bite. My teeth split right through the garnet flesh and were quickly interrupted by what felt like a rock. It was then that I decided that all “real” cherries should come with a warning label. Oh, it was like a plum or a peach, but just smaller. Weaving around the pit and spitting it out into the wood bowl, I was finally able to experience my very first black cherry. Crimson flesh gave off a subtle sweet flavor, while biting into the skin left with a distinct tartness. Before I knew it, my wooden bowl was looking a little sad with just leftover stems and pits that had been spat out of my little mouth. With a content tummy, I nestled down around my bare bowl and dozed off for a nap. I can imagine my mother’s face as I drifted off into sleep. It was probably a look of deep satisfaction. Because at that young age, I was completely unaware of my mom’s secret, natural sleepy time weapon, melatonin*. 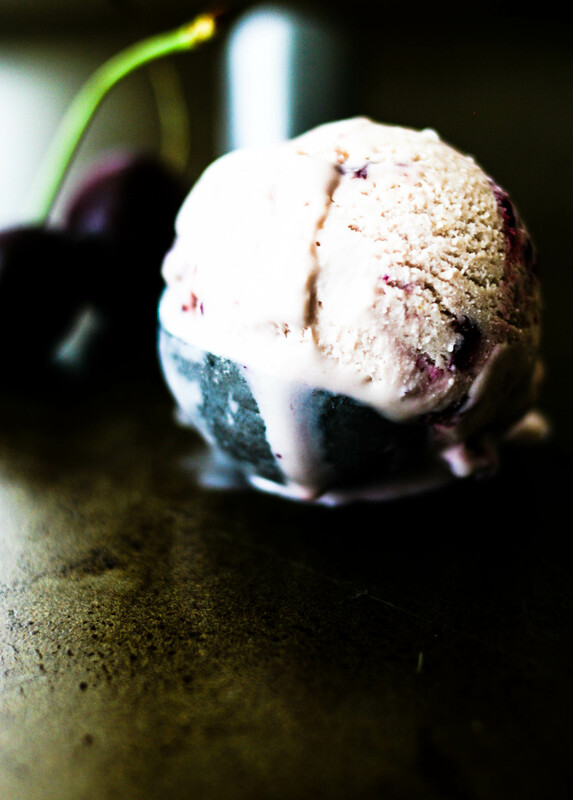 *Cherries are packed with melatonin. Melatonin is a hormone produced in the brain that helps with insomnia, jet lag and a myriad of other diseases and disorders. In other words, mom knew that these tangy orbs would make me SLEEPY! In a small saucepan, heat the whipping cream and almond extract to a simmer. While the cream is coming up to a simmer, whisk the yolks and sugar together until thick and pale yellow. While continuously whisking, slowly pour the hot cream into the egg yolk mixture. Once all of the ingredients are incorporated, transfer to a double boiler (or a bowl over a pot of simmering water) and stir continuously until thick enough to coat the back of a spoon. Let the mixture cool in the refrigerator until fully chilled. Transfer the base to an ice cream machine and begin to freeze according to the manufacturer’s instructions. 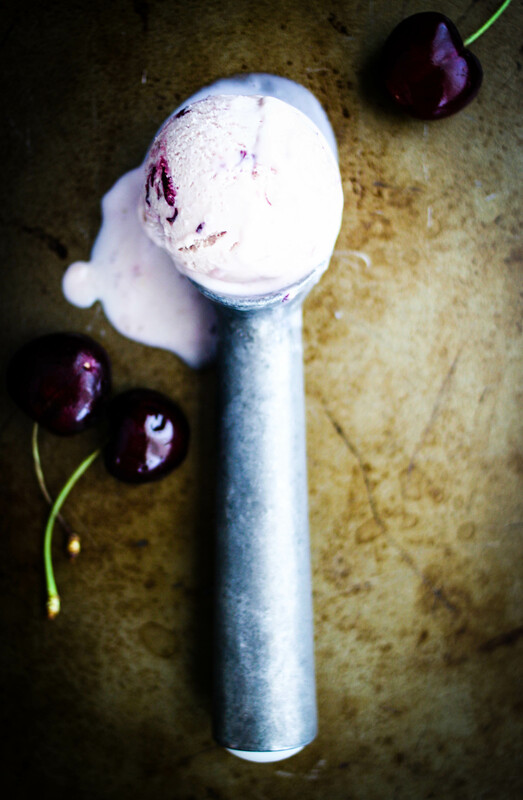 Once the cream has thickened in the ice cream maker, add the cherries. Continue churning the cream until the machine stops. Transfer to a container and let ice cream set completely for at least 2 more hours. whew! This is very satisfying! Mom loves it too she says. Very good and well done!